The week began with rain once again – an ‘English rain’ which lasted a few days. 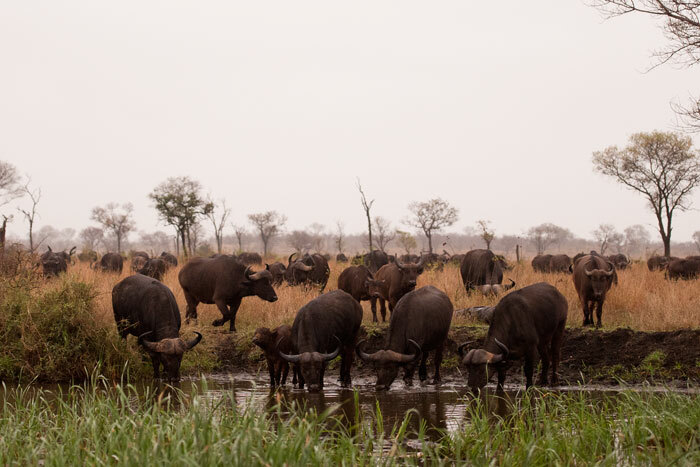 The buffalo don’t seem to mind the mist, however, and we were treated to a visit from the large herd of about 600. 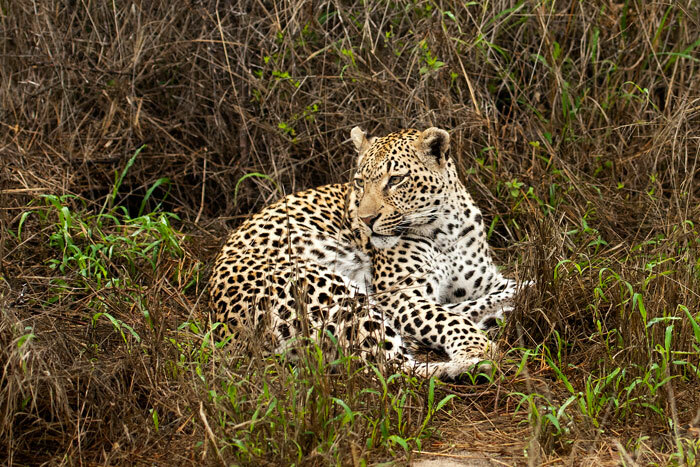 The rain can make it difficult to find certain animals, as not only do the tracks get washed away, but most of the mammals and birds seek shelter and warmth. 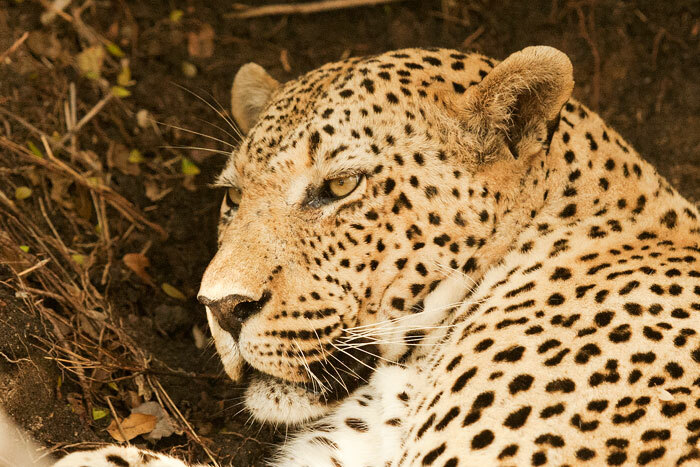 The Dudley Riverbank 3:3 Young Male demonstrated this when we found him curled up next to a thicket. We were lucky that he was next to the road so we could spot him! Despite the inclement weather, he then got up and walked around a bit, looking for something to hunt. He sharpened his claws on this fallen tree and then tried to hunt impala – but was given away by some nearby guinea fowl who alarmed upon spotting him. 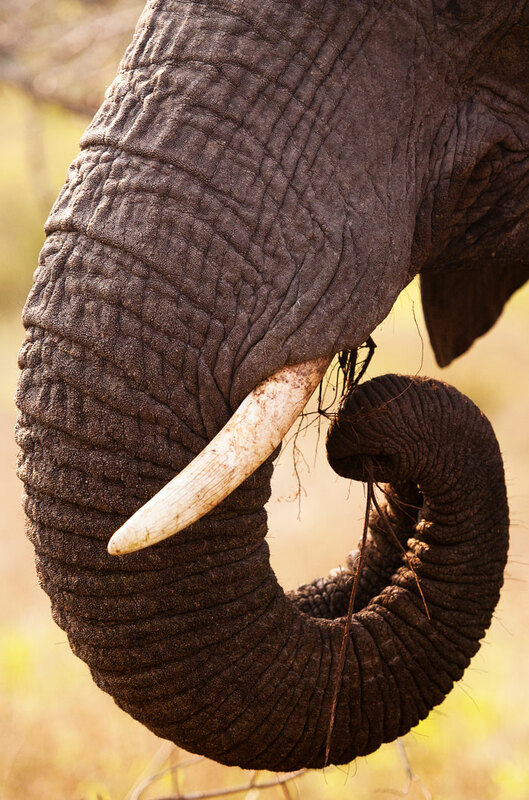 With the softening ground after the rains, the elephants are consuming more roots as the trees are easier for them to push over and the soil easier to dig into. Here, a cow chews on the roots of a bushwillow tree. 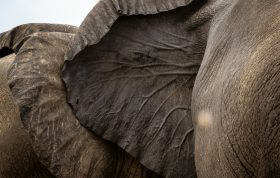 Because it is the end of winter, the trees are still storing the bulk of the nutrients in their roots, so naturally the elephants are attracted to them. 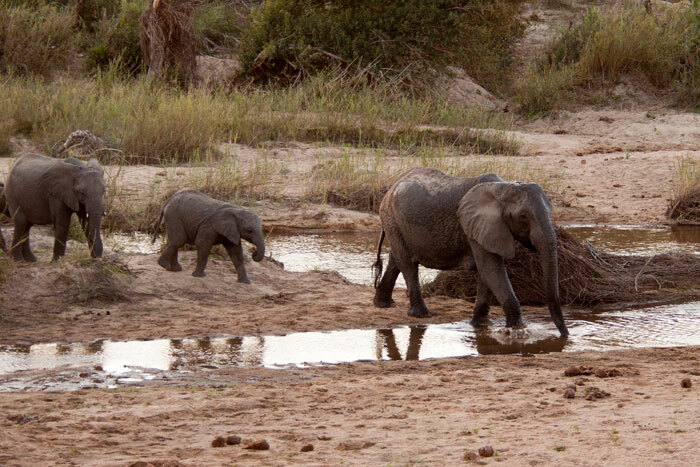 Almost all of our elephant sightings this week involved watching them push trees or dig… and explained all the mess of displaced soil and fallen trees around the reserve! In a brief moment without rain one afternoon, we were treated to another sighting of the new Tsalala cub, still giving her mom and the rest of the pride a hard time with all her playful energy! 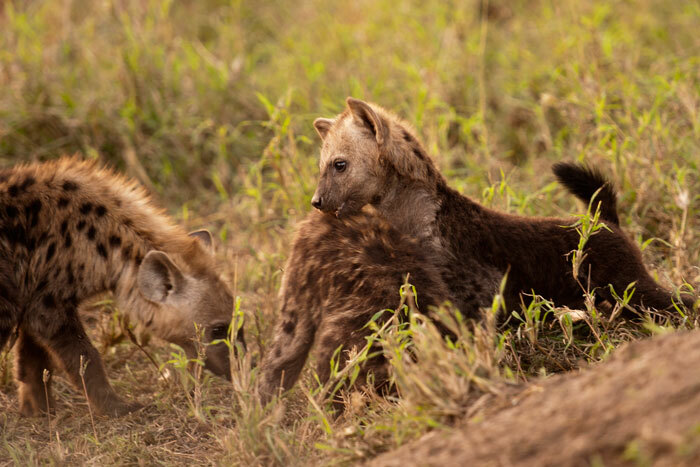 It must be difficult being the only cub around… but at least her mother, the Tailless Female, seemed tolerant of her antics. 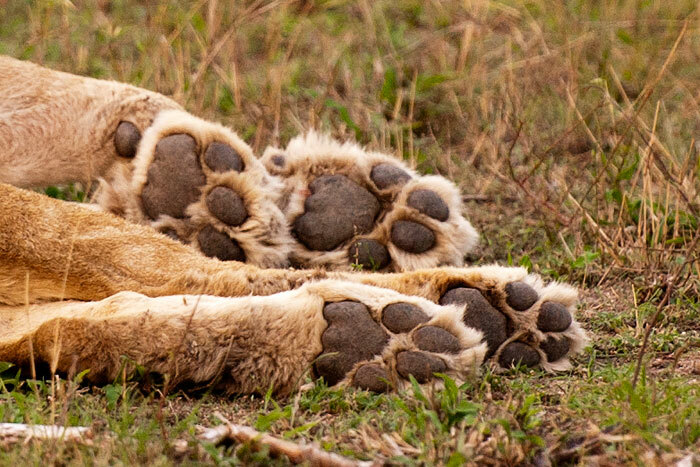 The four paws of the Tailless Female… which have claimed the lives not only of many unlucky antelope, but also of many lions. 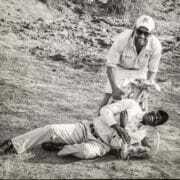 The Tsalala Pride is known for its territoriality and intolerance of other prides. As the rain cleared, the river rose slightly, filling channels that have been dry for the winter months. 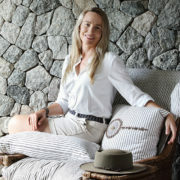 We had a sighting of the Vomba Female this week, along with her new cub which was showcased on the blog on Wednesday. 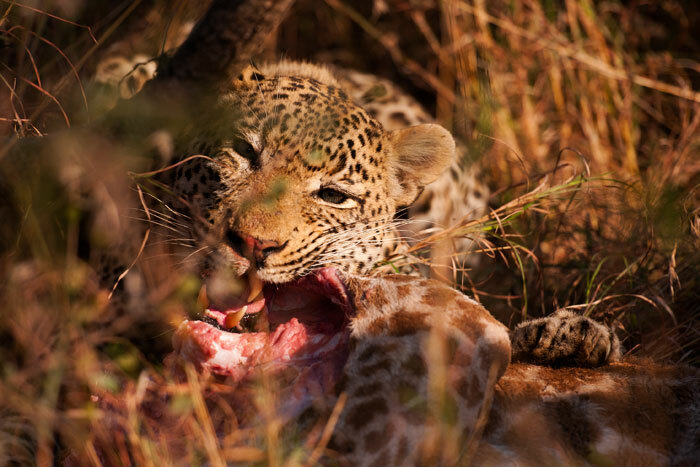 Stoff was lucky enough to capture some brilliant pics, but unfortunately in our case the cub was feeding on their duiker kill on the other side of its mother. We had a few glimpses of the adorable youngster, but I wasn’t quick enough with the camera! 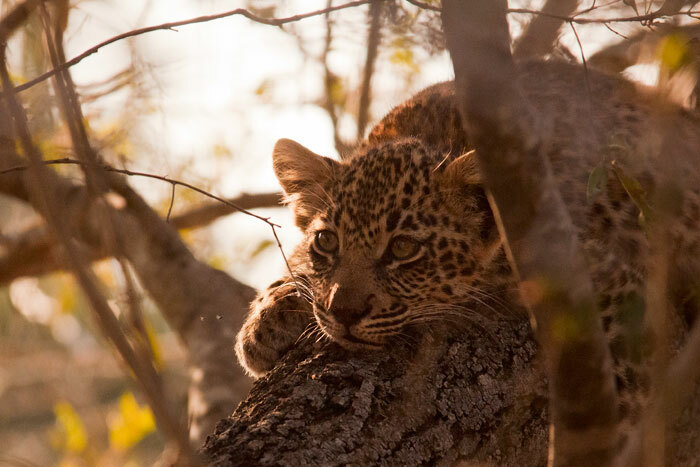 It goes to show, however, that even though we’re very lucky at the moment to have so many cubs around, leopard cubs are meant to be hidden and it is a truly special occasion to see them. 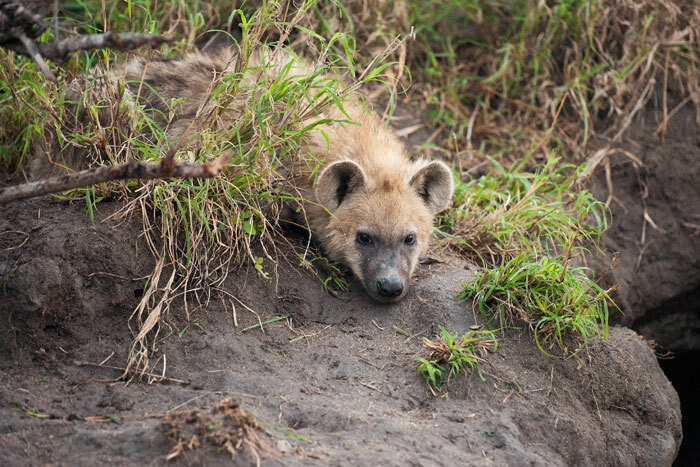 Some youngsters who weren’t hiding this week were the hyenas at the Maripsi densite! 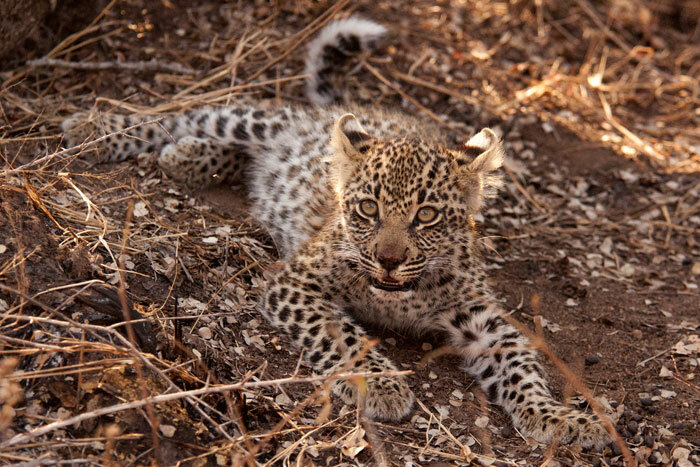 The cubs are of varying ages, and were all rather aggressively playing one afternoon. 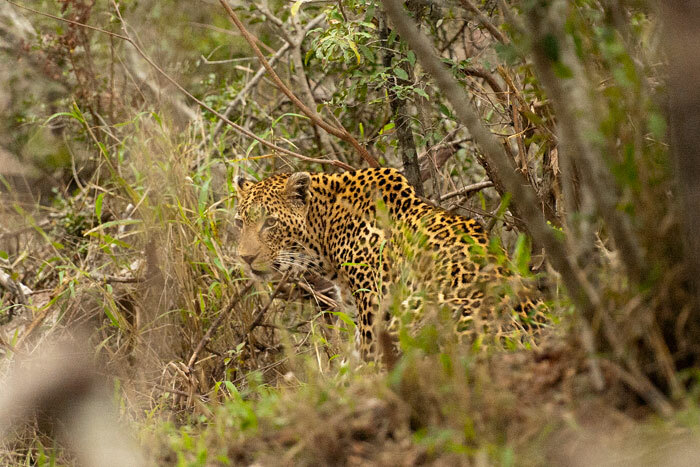 The Camp Pan Male took a break from his usual routine of stealing other leopards’ kills this week and caught a female kudu! A big kill for a leopard, the kudu carcass was too heavy to hoist in a tree so he fed on it form the ground for a couple of days, lucky to have not been discovered by hyenas. Here, he lies uncomfortably full after finishing the last bits. 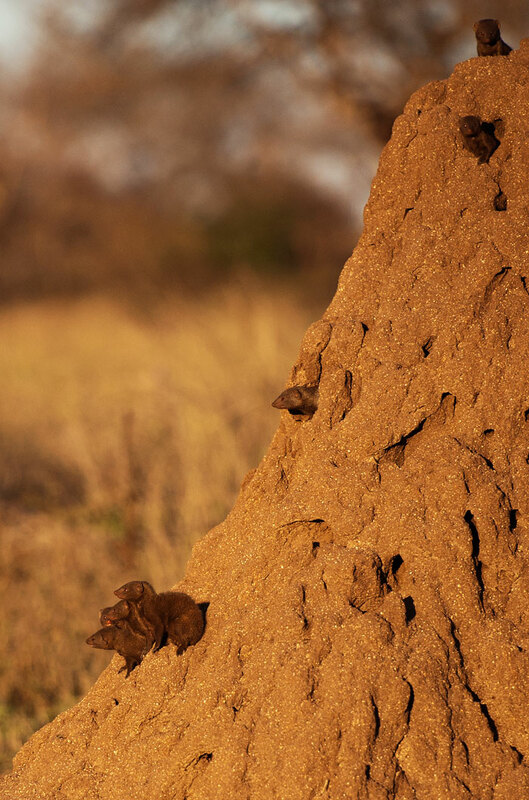 A business of dwarf mongooses gaze from their multi-level reconverted termite mound home, catching the last rays of sun on the first sunny day of the week! 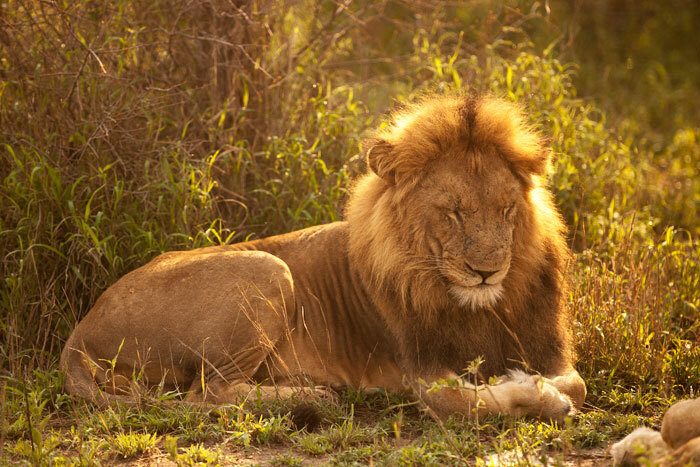 A Majingalane Male – the one with the broken tooth – sleeps near his current mistress, a Sparta Pride lioness. The mating pair were together for about 3 days this week. She is the only one of four lionesses in the Sparta Pride who does not currently have cubs… so we hope in 3 months’ time that will change! The next 3 images were actually taken at the end of July, but I never got to include them in a post. This was one of the first ‘stable’ sightings of the Dudley Riverbank cub outside of the densites. 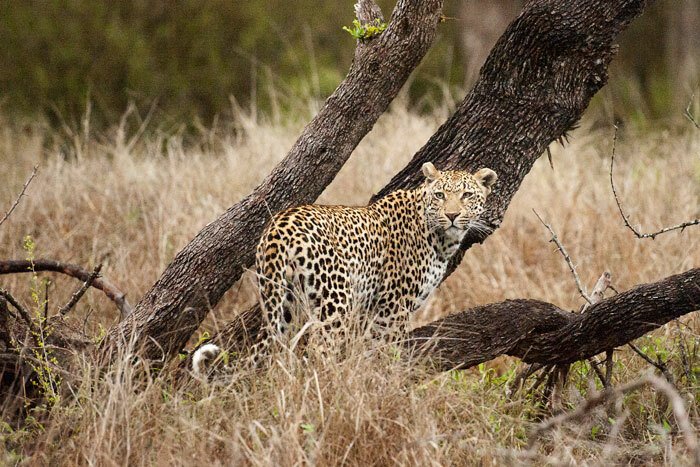 The youngster was found with her mother on an impala kill hoisted in this tree. We used this as an opportunity to gently expose the little one to vehicles, and a number of guests had the privilege of viewing this beautiful animal at close range. It’s a tough job sitting with a creature like this as she curiously played around us, becoming accustomed to the vehicles – but someone’s got to do it! 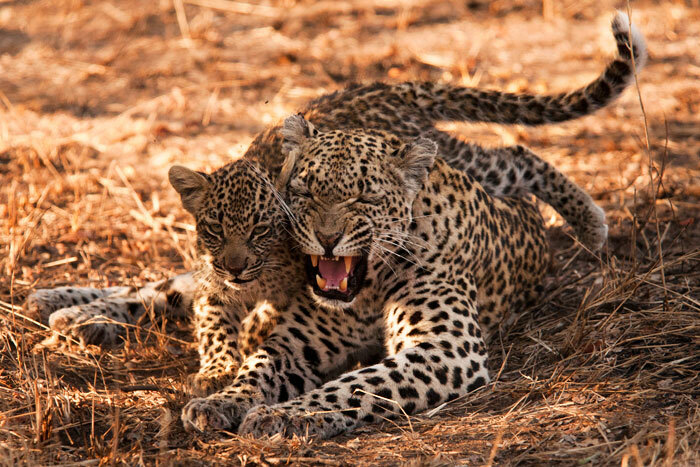 After a while she sought the company of her mother who was lying nearby – and clearly didn’t love being disturbed! Same scenario as our first sighting this week… but very different weather! 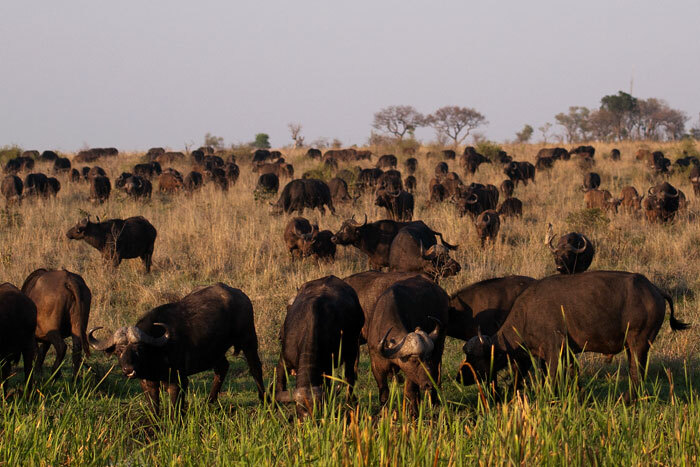 The large herd of buffalo came back for the new greenflush in the south of Londolozi. In the latter part of the week, the sun was a sighting in and of itself! 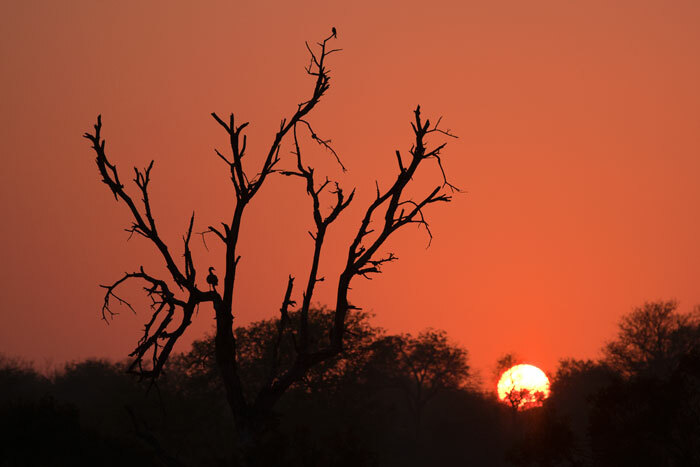 Here an Egyptian goose and a Forktailed drongo watch a gorgeous sunrise. 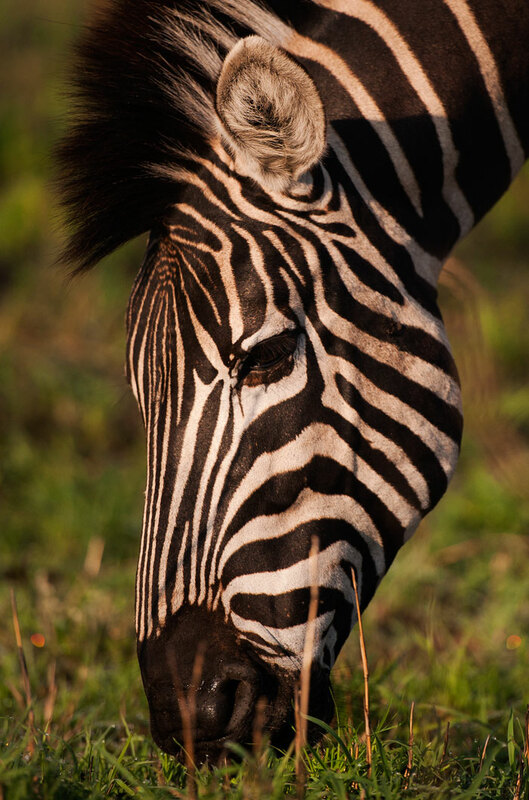 All of the new green grass has attracted many grazers like zebra, wildebeest, buffalo and rhino to the southern areas of Londolozi. 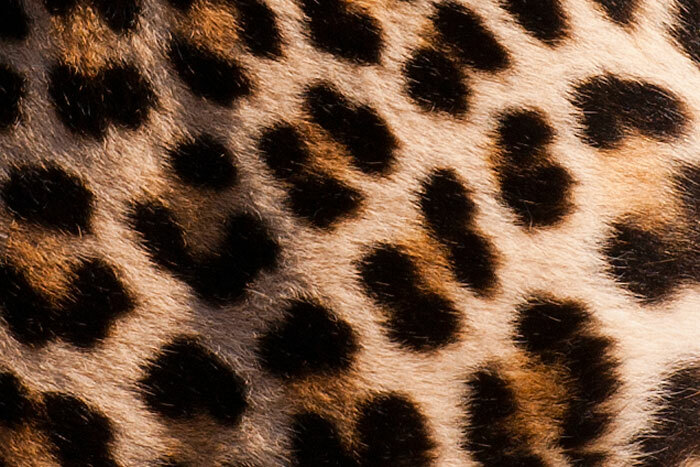 An up-close view of the leopard’s ‘spots’ – which are actually called rosettes, and differ from a cheetah’s polka-dot pattern. 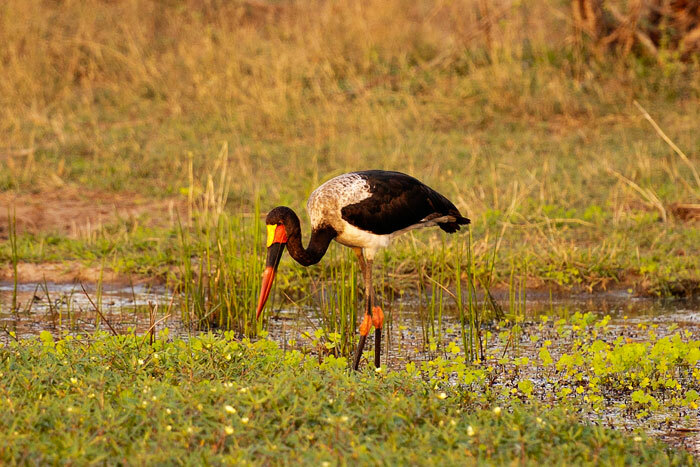 A Saddle-billed stork searches for frogs which have recently appeared in throngs in the waterholes around Londolozi. 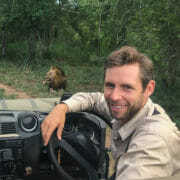 Our week wrapped up with a very interesting sighting of the Marthly Male. 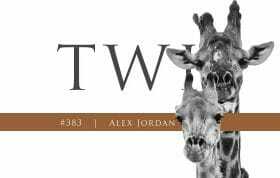 He had discovered the carcass of a stillborn giraffe being protected by its mother. He patiently waited until the giraffe eventually accepted its’ offspring’s fate and moved away, allowing the Marthly Male to drag the carcass under a nearby bush and feed. These pictures are perfect as always. I enjoyed it. Thank you. 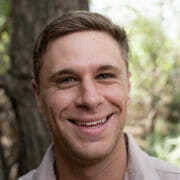 First welcome back, the pics are stunning & im looking forward to seeing everyone at Londolozi in Novmeber & bringing great memories & pictures back to Canada to my friends & family. Thanks Talley. Terrific as always. 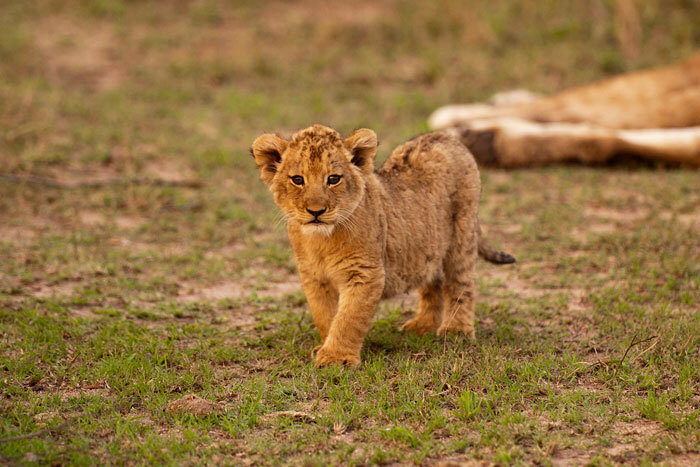 That is one fat lion cub ! Amazing as always – thanks Talley!